I recently found a place on the internet that helps a lot of women and girls around the world. It is called Fair Trade Designs. Fair Trade Designs only works with companies that strictly adhere to fair trade practices. What does that mean? It means the companies that have products on here do not have child or slave labor, they do not have sweatshops or cheap piecework. They pay their employees good wages and do not harm the environment. Here is the Red Tagua Nut Heart Pendant I received. Isn’t it pretty? It goes with lots of things too. 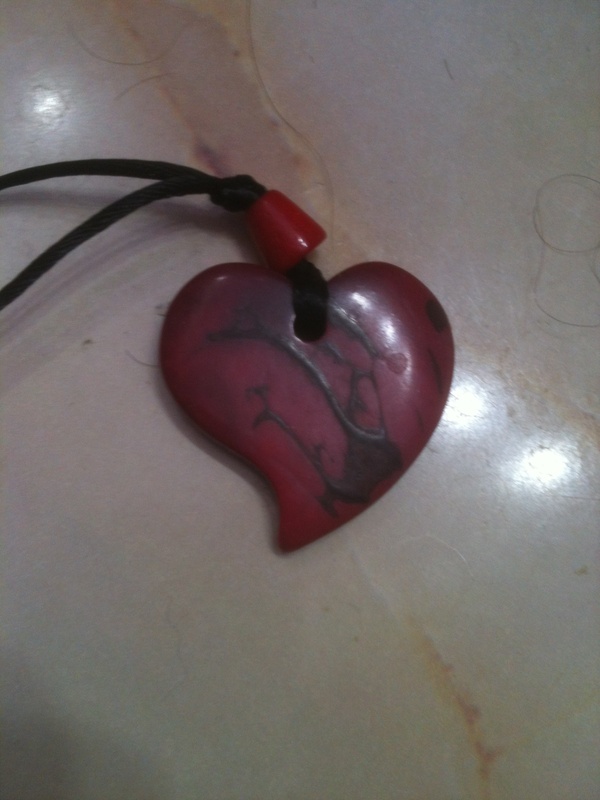 This is a hand carved Tagua Heart Pendant made out of the Tagua Nut. It is a renewable rainforest seed that grows from the Amazon’s Tagua Palm Tree, It is regarded as vegetable ivory for it’s likeness to real animal ivory. Tagua has become a highly valued commodity by artisans and consumers a like. I love the color of this Heart Pendant it is achieved by boiling and other natural techniques that enhance the nut’s natural beauty. You can find all kinds of products on Fair Trade Designs such as jewelery, kitchen linens, purses, bags and stationary. Some of the products are made by women rescued from human trafficking, the second largest illegal trade behind drugs or by companies that donate to non-profits trying to eradicate this most barbaric violation of human rights. Everything you purchase at Fair Trade Design has a bit of a story behind it ~ and when you look at the description you can read about who made it. Your purchase of products helps to support the efforts of organizations fighting this crime against humanity. If you would like to purchase this Heart Pendant or any other item from Fair Trade Design you can do so HERE and feel good that you helped someone in need. Fair Trade Designs has offered to give one of my readers the chance to win the same Heart Pendant I won. You must be 18+ and have a US shipping address. Leave a comment on what items you like on Fair Trade Design. Follow Fair Trade Designs on Facebook for a extra entry. Extra entries for each way you follow Kaisy Daisy’s Corner. Giveaway ends Jun 12, 2013. I love the spring garden clutch! Lot’s of nice things, some great deals, and I bookmarked the site. I think my favorite would be the Copper Oval Ring. I love the Silk Clutch in teal, and the Odette Necklace. Wow they make beautiful things! Such a great company. I love the beaded necklaces! I love the African Sunset Candles and the South African Mini-Journals! Such unique stuff! Love it 🙂 Thanks for the giveaway! I really like the fused glass earrings! I liked the Cross-Body Zipper Bag. It would make a nice gift! That heat piece is so pretty and unique.. I love it! But I also fell in love with the Bali Beaded Cuff with Wood Clasp.. Love these pieces! The items I like on Fair Trade Design are the Tropical Tote, the Chroma Bracelet, the Tagua Confetti Bracelet, the Mozaic Tagua Nut Necklace and the Princesa Beaded Necklace. I love this pendant! I love red so it is perfect. There are many nice things on the site as well.